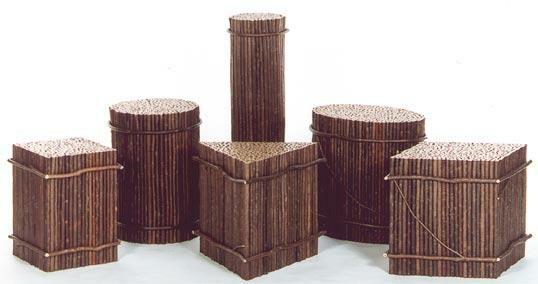 Bundle tables made in various sizes and shapes. Other sizes available to fit your specifications. My husband gave me three of these tables to use in our great room a year and a half ago. The gift was a surprise and I was elated. I have the triangle and two squares. Our home is a rustic ranch full of browns, tans, parchment and butterscotch colors. Our furniture is leather. These tables look amazing in our home and I could not have asked for more artful and unique pieces. They are, of course, very functional as well. They’ve added considerable character to our home, and they have become prized possessions. Thank you for your feedback, Dru! It sounds like your lovely home is a perfect setting for these tables.